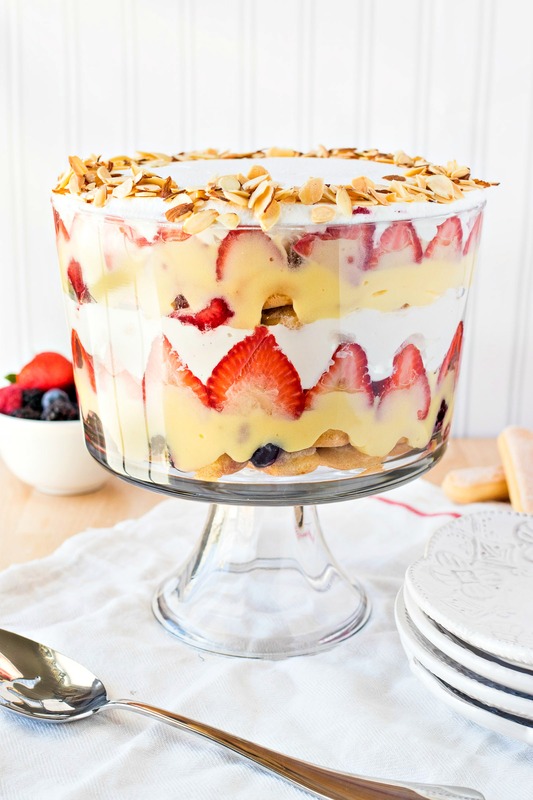 Traditional English Trifle – This traditional English trifle is a layered dessert made with ladyfingers soaked in sherry, fresh berries, vanilla pudding, and fresh whipped cream. The combination of these flavors and textures will blow you away! So much of what I learned about cooking comes from Food Network stars like Bobby Flay, Ina Garten, and Giada de Laurentiis. The way they talked about food and knew so much about it captured my attention immediately. I started watching when I was about 13 and have been obsessed ever since. But now I also watch a few new favorites like Pioneer Woman and Farmhouse Rules. Baking, however, is a different story. My first memories of baking were with my grandmother. She taught me how to make some her famous recipes, like her apple pie, and even bought me my first cookbook. And I still have it! And maybe I still cook from it…Hey, those children’s recipes are still really good as an adult! When I got a little older, she taught me one of the most beloved recipes in our family. Ever since I can remember, we’ve had it on Christmas Eve after dinner and if I ever try to make anything else, my sister would most definitely veto. Say hello to our family’s traditional English trifle! Trifle has become more popular than it was when I was growing up so you’ve probably heard of it before. Most people have heard it from that episode of Friends, when Rachel adds ground beef to the trifle by accident. Have you seen that episode? It’s a classic one. Prior to meeting me, this was my husbands only exposure to trifle so I had to reassure him that mine was going to turn out much better. But in case you haven’t heard of it before, a trifle is, at it’s most basic level, a large parfait. It’s layered with various flavors and textures, usually with cake, pudding or custard, and a whipped cream. This version is made with ladyfingers soaked in Sherry, fresh strawberries, mixed berries, vanilla pudding, and fresh whipped cream. Now, I know I called this a “traditional” English trifle, but there are a couple differences: the traditional version uses jam instead of berries, cake instead of lady fingers, and some versions even have bananas. And I’m pretty sure the English don’t use instant vanilla pudding like I do. But the real thing just takes toooo long, okay? This is a judgement-free zone. I’m sure I don’t have to explain why this trifle is to-die-for. There’s not just one texture or flavor at play here, but rather a collection of them – juicy fruit, fluffy (and slightly boozy) ladyfingers, thick and creamy vanilla pudding. All of these awesome layers come together to make an unforgettable dessert. And for that reason, this recipe isn’t just a showstopper with my family – my friends are obsessed with it too! Every time that I’ve made it for a potluck, people go crazy for it. But just because it tastes (and looks!) amazing, doesn’t mean that this trifle is impossible to make. In fact, it’s rather easy to make. All you’re doing is layering things, people! And like I said above, you’re not even making the pudding from scratch so you really have no excuse to not make this dessert for yourself. I have made this trifle a million times and I’ve learned that the best trifle I’ve ever made was one that had time to “settle” into the dish overnight. You can also make it first thing in the morning if you plan to serve for dinner. The point is that you should make this ahead of time and NOT immediately before you plan to eat it. If I really want to plan ahead, I cut the strawberries and make the pudding even sooner so they can chill in the fridge for a few hours before assembly. This is not required, though. The Sherry is a little strong, so if you’re serving to kids, you may want to cut amount in half. Replace the other half of sherry with apple juice so you still have enough liquid to soak the ladyfingers. Speaking of the ladyfingers, I’ve made the trifle with two different kinds: crunchy and soft. You can use either for this recipe. However, this recipe was written with crunchy ladyfingers since they are the ones I see the most frequently in stores. If you do decide to use soft, make sure to toast them in the oven so they don’t get soggy from the Sherry. If you can’t find ladyfingers at all, pound cake will work just fine. But you will also need to toast it a little. I’ve made the trifle in a trifle dish from the very beginning. If you don’t have one, this is the one I have. You can also use a glass bowl but I don’t think the presentation is as pretty in a bowl. If you want to get extra fancy, you can make the trifle in individual dishes. They are the cutest things! Here’s a link to those, as well. I hope you love this family-favorite dessert of ours! It’s sure to amaze your family, too. Let me know how you like it in the comments below! This traditional English trifle is a layered dessert made with lady fingers soaked in sherry, fresh berries, vanilla pudding, and fresh whipped cream. The combination of these flavors and textures will blow you away! Make pudding by mixing 5.1 ounce package with 3 cups of cold milk (if your package has difference measurements of milk, follow those). Whisk to combine until it's thickened. Place in the fridge to thicken a little more until we need it. Make whipped cream by adding heavy cream, sugar, and vanilla to the bowl of a mixer. Beat with whisk attachment until thickened and stiff peaks form. Set aside. Layer 1/2 of the ladyfingers on the bottom of a trifle dish. Slowly pour 1/4 cup of Sherry wine over the ladyfingers. With a slotted spoon, scoop half of the thawed mixed berries over the ladyfingers. They should be strained enough with the spoon, but don't worry if a little extra juice gets in there. Layer 1/2 of the prepared pudding over the berries, making sure that they are completely covered. Add 1/2 of sliced strawberries over the top of the pudding. If you want a nice presentation, you can line the edge with strawberry slices standing straight up. Layer 1/2 of the whipped cream over the strawberries, completely covering them. Repeat layers. Sprinkle toasted almonds (that have cooled) over the top layer of whipped cream. If the almonds are still warm, they will melt the whipped cream so make sure they have cooled. Let the mixture set in the fridge for at least 2 hours before serving (ideally overnight, if possible). *If using soft lady fingers, toast them in a 350-degree oven until they've slightly browned on top, about 5 minutes. This will help them absorb the Sherry a little better without getting soggy. *You can toast the almonds by placing in 350-degree oven for 5-7 minutes until slightly browned. I am so excited to try this recipe! I grew up having Trifle during the holidays and I have not had it since I moved away from home some 35 years ago. I recently attended a Charles Dickens Fair and they were serving scones with lemon curd, tea and trifle! It inspired me to want to make it myself! When I found your recipe, I was ecstatic! Your pictures and step by step instructions are wonderful to follow! Oh wow…this looks amazing!!! Best of all, I love how you walked through the steps with the dos and dont’s. I love to cook, but baking does not come so easily to me. This actually appears to be simple enough that I can do this. Thanks for sharing. This looks beautiful and delicious! I’ve never made a trifle before, but will have to try it! Perfect dessert for Easter. This is making me drool! I definitely need to make this for my hubby! I have a trifle bowl and I’ve used it exactly ONE time…this recipe is going to be #2! Sounds amazing!! Haha I only use mine for this recipe! I need to branch out too! This looks absolutely amazing! I just want to take my spoon and take a scoop. I immediately thought of the Friends episode with the trifle when I saw this post. Lol! However, yours is a thousand times better than Rachel’s. 🙂 Yours looks so pretty and neatly arranged. I would love to try it! Haha yes everyone thinks of that episode when I say trifle! I had been eating trifle before I even saw that episode so it was especially funny because I knew exactly how that dessert should be made! This looks absolutely amazing! I’ve always wanted to make one of these, and as it would make a show stopping Easter dessert, I may do just that! Thanks so much! You’re so right about it being a showstopper but they’ll never know how easy it was to make! That trifle brings back so many childhood memories! I used to make this with my mom and it was my favorite dessert as a kid. I can’t wait to make it with my kids someday! This looks way too good to pass up! This trifle looks so delicious! I love the idea of the crunchy almonds on the top to finish it off, so good! My grandma, who was my favorite person on earth, used to make this (or very similar to this) and it was always my favorite. I have a trifle bowl that I got for my wedding and I like to make this in memory of her. Aw that is so sweet. I am so touched that this trifle reminded you of your grandma and the one she made for you. Thank you for sharing that! Seriously salivating as I was reading this. Can’t wait to try it! You outdid yourself. This trifle looks AH-MAZING! Pinning for later. I love a good trifle, it reminds me of my grandmother. And it reminds me of the episode of Friends where Rachel accidently added beef! lol, this looks like a great recipe! Looks awesome. I’ve seen this before in pictures but never tried it. Maybe I’ll venture into making this soon. I have a couple packs of ladyfingers that Iw as going to use for tiramisu anyway. Awesome! I hope you give it a try soon! And speaking of tiramisu, I’ve been planning to make that myself so if you have a great recipe, let me know! What a lovely looking dessert. I love the dish so you can see the delicious layers. Yum! This looks delicious!! It’s beautiful. Anytime I see a trifle I think of the Thanksgiving episode of Friends. Mmm! All of those strawberries have me drooling over here! Yum! This looks delicious. Thanks for sharing! I made something like this not that long ago and loved it! I vowed I was going to make another one when I found the right recipe. I think I found it! That looks really good! Saving this for future use. Making trifles are such an easy and fun treat. Plus the presentation is beautiful and feeds a bunch. No kidding! I was eating it for days after making it. I ended up sending it to my husband’s work bc we just couldn’t tackle it ourselves! This looks amazing! I might have just found my Easter dessert! That trifle looks amazing. I will definitely have to be trying this out. I will definitely remember to make it and give some time for it to sit before serving. Thanks so much! Glad you appreciated the tip! have you watched the great british bake off? currently im obsessed with that show and have been wanting to bake all things pies, bread, and pastries. i don’t make triffle nearly enough but i do love a good triffle with textures and creams. your version certainly sounds amazing, es p with lady fingers. I’ve heard of it but I’ve never watched a full episode. But it sounds like a show I would LOVE. I’ve seen it on Netflix so I’m gonna start watching it soon! They’re the perfect touch, aren’t they?! This looks absolutely amazing and yummy. I have to make it soon. Yay! Come back and let me know how you like it! Wow! It’s so pretty and SPRING looking! I know it’s a heavier dessert, but it’s just so lovely! My mouth is WATERING, this looks SO GOOD! Aw thanks to much! It was so hard not to eat the whole thing!